A plant steeped in superstition, holly is considered bad luck if you burn it, chop it down, remove branches or bring it indoors (except for at Christmas time). In the past, holly was thought to possess magical properties. It was kept to protect against unfriendly spirits and to ward off ailments in children. Pliny tells us that holly should be planted near the house to repel poison and protect against lightening and witchcraft. 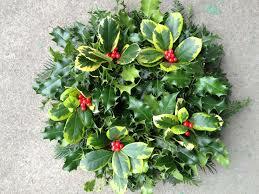 The use of holly in wreaths is thought to descend from a Roman custom of sending holly boughs and other gifts to friends during the festival of Saturnalia. The custom was then adopted by early Christians. Holly berries are moderately poisonous to humans but are an important winter food source for numerous species of bird, especially after they have been softened and made more palatable by frost.